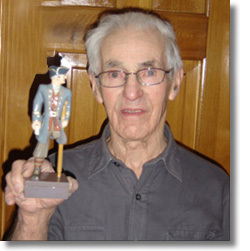 Cecil Mason was born in Lunenburg, Nova Scotia in 1919. He worked for a local fish plant as a fish trimmer and weigher for 45 years. When he was a teenager, his sister entered his carving of boxer Primo Carnera in the Lunenburg Fisheries Exhibition, where it won first prize. Although he had an interest in carving from the time he was young, Cecil quit school at age 15 and went to work at the fish plant, and did not start carving again until his retirement in 1986. He enjoyed carving during his spare time when he was not reading or watching television. He especially loved the sport of boxing, and many of his carvings were of boxers from his youth. His carvings are made from white pine - the base and the figure being one piece of wood. Each carving took approximately 25 hours, which he did "a couple of hours at a time". He uses old tools from the fish plant that he brought home when they were no longer useful for trimming fish, and later filed them down for his own use. Click on image to enlarge and see description.